Douglas Fairbanks, Sr., on his way to Europe on his honeymoon after marrying screen darling Mary Pickford, had brought a stack of All-Story Weekly pulp fiction magazines with him to read during the crossing on the steamer Lapland. He was struck by the hero of Johnston McCulley’s The Curse of Capistrano—Zorro, of course—and decided that he’d found the subject of his next movie. The next year Fairbanks played the starring role in the story he’d re-titled The Mark of Zorro; it was a gigantic hit, and Fairbanks was to spend the next ten years as a movie swashbuckler, appearing in lavish productions as Zorro, d’Artagnan, and Robin Hood. 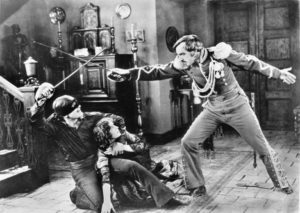 The Mark of Zorro is a genuinely great film, the movie that elevated Douglas Fairbanks from star to superstar. His athleticism and charisma are legendary, of course, but damn it, the man could act: his foppish Don Diego is as hilarious and nuanced as his heroic Zorro is rousing and romantic. The villains are also uniformly excellent: Robert McKim’s Captain Ramon is every bit as mocking and arrogant as Basil Rathbone would be later, and Noah Beery’s swaggering rodomontades as Sergeant Gonzales even steal the scenes he shares with Fairbanks. All the elements of the Zorro legend are here, fully formed: the black mask and cape; the hidden cave under the hacienda; the mute servant, Bernardo; even the black stallion, trained to follow its master’s orders. Plus the action scenes are great—Fairbanks famously did all his own stunts—the cinematography and direction are sharp and free from the theatrical staginess that plagued a lot of the silents, and the period details are spot-on. Not to mention that this film is indisputably the direct inspiration for the Batman. If you’re a Batman fan but haven’t seen The Mark of Zorro, you’re just not fully aware if that character’s origin.